According to Max Strom, We live in fear of terrorism but in actuality the most devastating terrorism comes from within us as we sabotage ourselves.” With practical techniques, A Life Worth Breathing offers us a path to transformation with visionary insights on forgiveness, gratitude and self-empowerment. The teachings are rooted in Yoga, Sufism and Eastern philosophy, but make no mistake, this is not just another yoga book of postures, it is a guidebook for living. A Life Worth Breathing teaches us that by healing our past emotional wounds, silencing the inner critic that cripples us, and cultivating a yoga and breathing practice, we can elevate ourselves from the mindset of a reactionary victim to a higher level of awareness and empowerment. With these life skills we can achieve our true destiny, that of a fully integrated soul living an authentic life of meaning, success and joy. A life worth living, a life worth breathing. ©2010 Max Strom (P)2014 Audible Inc. I can certainly recommend this book because it explains the different kinds of yoga and many recommandations concerning yoga. But the number of breathing exercises are very limited. And the last 3 chapter there's very high level vague talk about religion. Religious people will love this but I'm down to earth. Nevertheless this book motivates to start with yoga. What made the experience of listening to A Life Worth Breathing the most enjoyable? Max Strom's voice is incredible. It made listening very enjoyable. The philosophy of yoga was in there -- but not disguised with modern academic-speak. While I understand those who choose to use it -- it certainly doesn't make me feel that I am diving into myself when I have to turn on my academic brain to understand that meaning. What was one of the most memorable moments of A Life Worth Breathing? At one point I remember he paused, took a breath and sighed. I love that they left that in. What does Max Strom bring to the story that you wouldn’t experience if you just read the book? I already said this... but his voice. I will purchase his other books just to hear his voice again. No. I bought this book to aid me on my spiritual journey. This was a book I would listen to bit by bit and digest it. I will listen to it over and over again as well. It is a treasure. This is true yoga teachings. This is a rare find. I feel blessed to have found it. One of the best books about how to live I've ever encountered. Truly a masterpiece. Max Strom offers exceptional guidance. After reading this book, I decided to purchase several copies to give as a gift to all of my friends for Christmas. This is a very well written book - simple, concise with so much depth and humility from the author. It uses yoga and breathing as a tool to achieve a happy, healthy and fulfilled life that not only benefit yourself but everyone around you, and eventually the world. I've been practicing yoga for a little over a year, read several books on yoga including the classics, and I place this book in my top five favorites. I believe that this book given the chance can deeply touch the lives of many and encourage a spiritually based wellness lifestyle that can help change the world. If you could sum up A Life Worth Breathing in three words, what would they be? Whenever you need to focus your meaning in life, this book will direct to in the right direction! As a Yoga teacher, I constantly remind my students to Breath and take deeper and longer breaths. This book in audio is relaxing to listen to, and the message is true. Thank you for coming into my life!! One that I want to listen to over and over again to absorb the knowledge. Would you listen to A Life Worth Breathing again? Why? yes, I am already on my 3rd time. So much valuable information for anyone looking to transform there life and stop playing the blame game. 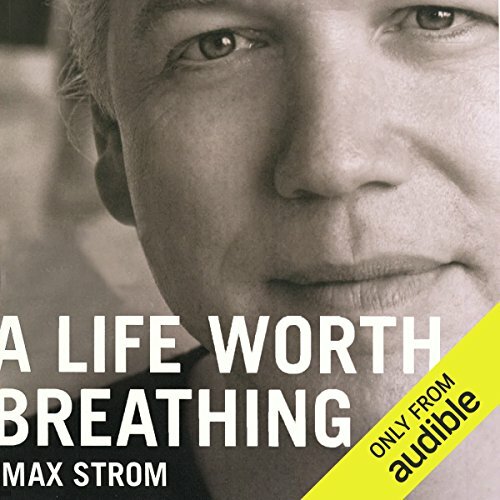 Would you consider the audio edition of A Life Worth Breathing to be better than the print version? I would highly recommend listening to Strom's reading of his book, 'A life worth breathing' if you're performing yoga for the mental and spiritual benefits as well as physical. This book helped me connect with the sense of purpose that focusing on the now during yoga, as well as life, provided me. It's a quick listen, I got through it in a week, listening about an hour a day on my headphones while I was getting other things done. Have you listened to any of Max Strom’s other performances before? How does this one compare? ...I've known of Yoga for years. However, I wasn't sure if it could fit within my "Christian" belief system. I took a chance on "Max Storm" and in my humble opinion I chose well. His presentation seems so authentic and attentive. This was one of the most enjoyable books that I have had the pleasure to listen to. So, I bought its hard and softcover companions because I loved it so much...like to highlight in the softcovers and keep the hardcovers clean. Only certain books get that distinction within my personal little library. Loved it. Max is a very articulate and thoughtful speaker, with a naturally calming and soothing voice. He offered many thought-provoking insights in this book, and I look forward to adopting some of his approaches in my day-to-day life. Again, if you're seeking enlightenment, wisdom, and happiness in an enriched life, then this is well worth a buy. Where does A Life Worth Breathing rank among all the audiobooks you’ve listened to so far? It made me reevaluate my life and actions. Made me cry from the amount of Truth in it. As a yoga teacher myself, it has been an invaluable discovery. And I am currently listening to it again. I appreciated that no matter what your faith is the principles in this book build upon what you already believe. It enlightens new thoughts and ways of understanding what you have been too preoccupied to see. I love that he teaches you how to breathe. I noticed that through my new breathing techniques, though I am a beginner, everything is coming easier and I am less timid about failure. I especially appreciated the segment about death. I found myself clapping to be understood in the way I also perceive it. I will read this book again and again and I suspect each time I will learn something new! update: I bought this book a long time ago. It continues to be my absolute favorite book. I have listened to it over 20 times. if i could only keep one book it would be this. i love listening to max strom, he inspires and encourages us to live a better life and has totally transformed how i see the world. if everybody read this book the world would be a better place!